Life is not treating Giles Fairhaven, Viscount Kincade, well. After a night of gambling losses, he was awakened well before his usual hour by a barmaid demanding payment for amorous services rendered the night before, and then he discovered his purse had been stolen. That news earned him contempt and rudeness unequaled in the viscount’s experience from the suspicious host of the Golden Eagle Inn. Before he can leave the inn, Giles is attacked by three thugs. Rescue comes from an unexpected source, a bare-footed, nightgown-clad lady armed with a gentleman’s black umbrella. The Honorable Daisy Morrison, the older daughter of a baron, is a force to be reckoned with. Accustomed to command, especially after two years of directing her deceased father’s estate and directing the lives of her mother and younger sister, Daisy is confident that she is the only chaperone needed for the trip she and her sister will make to London where Daisy intends to find the younger Rose the kind of husband Daisy believes Rose’s sweetness, beauty, and wealth deserve. She also has no hesitation in rushing to Giles’s aid when the innkeeper refuses to interfere in the brawl. Having routed the thugs and seen the battered Giles on his way, she also silences the innkeeper’s slander of the absent Giles by paying not only his reckoning at the inn but also the barmaid’s charges and his gambling debt. For Daisy, all of these activities are just part of taking care of those who need her help. Giles is humiliated when the servant he sends to pay his bills at the Golden Eagle returns with the viscount’s money and the news that Miss Daisy Morrison has already paid the viscount’s accounts in full. His humiliation reaches a new level when he learns that his rescue by the small lady with a large umbrella has become common gossip and made Giles the laughingstock of London. He is certain Daisy is the source of the gossip. When he meets her and Rose walking in Hyde Park, he arranges a second meeting during which he plans to leave Daisy reeling from a severe tongue lashing even if he controls his instinct to strangle her. Instead he finds himself agreeing to ask the help of his cousin, Lady Hetty Parkinson, in introducing the Morrison sisters to society. Daisy wonders if the viscount could be Rose’s perfect match even as she tries to ignore the tendre she herself is developing for him. Convinced that at twenty-five she is a settled spinster, Daisy dreams of romance not for herself but for Rose. However, the docile Rose, although reluctant to disappoint Daisy, proves quite stubborn about ignoring her opportunities and making her own choice. Meanwhile, Daisy continues to turn Giles’s ordered universe chaotic and increasingly to play havoc with his heart. A mock engagement, a kidnapping, and other dangers may present obstacles, but ultimately true love conquers all. 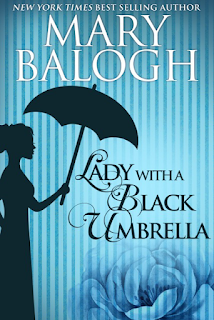 Balogh is probably best known for richly emotional romances rather than for light-hearted romps, but she is equally skilled at giving readers stories that are a delightful mix of sweet romance and screwball comedy. 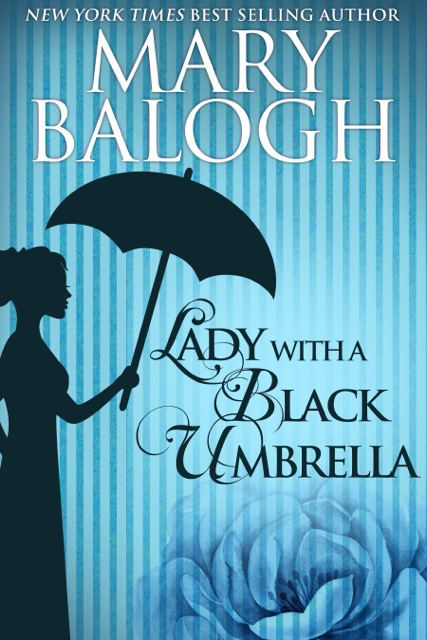 My favorite of her humorous romances—and one of my all-time favorite romance novels—is The Famous Heroine, but Lady with a Black Umbrella is almost as good. I have had an abiding fondness for the managing heroine since I first read Heyer’s Frederica and The Grand Sophy eons ago, and I also adore stories that pair a stuffy hero with an unconventional miss who shatters his dignity. This story satisfies on both counts. It is irresistibly funny to see Giles losing more and more control. Lord Kincade’s eyes strayed to Daisy’s smooth slim throat with some regret. He had been so looking forward to having his hands there. Or even if everyday reality kept his hands at his sides, then he had really looked forward to ripping up at the woman, telling her exactly what he thought of her interfering, tattling ways. And yet here he was still clasping her hands—he dropped them in some haste—and allowing himself to be the object of her smile of warm admiration and gratitude. He is divided between a desire to throttle her and a desire to kiss her, with the latter feeling growing stronger by the day. Daisy, of course, is sublimely unaware of the effects she has on Giles, and she stubbornly persists in her conviction that she is past the age to be courted and too strong-minded not to dominate any man who married her. Watching her proved wrong is a delight. In addition to likeable, entertaining leads, Balogh uses secondary characters to add interest and appeal to the story. The villains are one-dimensional, but the family members of Giles and Daisy are wonderfully drawn. I particularly like the Reverend Arthur Fairhaven, the younger brother of Giles. This gem of a book was among four long OOP Balogh romances released in digital format earlier this year. Many of my favorite Balogh novels belong to her traditional Regency period. Rereading this one was a joy, and I highly recommend it to Balogh fans who may have missed this one or to any reader of historical romance looking for a romance that will evoke gentle laughter and sighs of readerly satisfaction. I love the sound of this one and it's a book I managed to miss the first time around. Thanks for another terrific On Second Thought review, Janga! Thanks for the review Janga ...What a treat! I really enjoyed some of the early Balogh novels .... they were among the first romance stories that I stumbled on ... and Balogh was a Brit .... or even better Welsh! I must check out Amazon to fill the many gaps in my Balogh library. I'm also checking Audible UK for audio versions. These particular ones are not available yet but new ones have appeared since I last checked. I can't believe that I missed this one. I thought that I'd read all of Mary's books. Hmm, I need to find this as it sounds really good. I missed this one, too. I loved The Famous Heroine and her other traditional Regency novels. I'll be looking for it, that's for sure. I haven't read this one yet, but my goal is to read all of Mary Balogh's stories. This is the first I've actually heard of this book. Thanks for the review. I'm definitely going to read it.